Presented as a triple bill, the shows Arc, Every Action… and Memento Mori play out on three unique pieces of aerial equipment: a suspended raft that turns and pivots midair; a 25 metre rope threaded over two pulleys to create a sort of aerial scale; and a rigid, metal, trapeze-like frame. 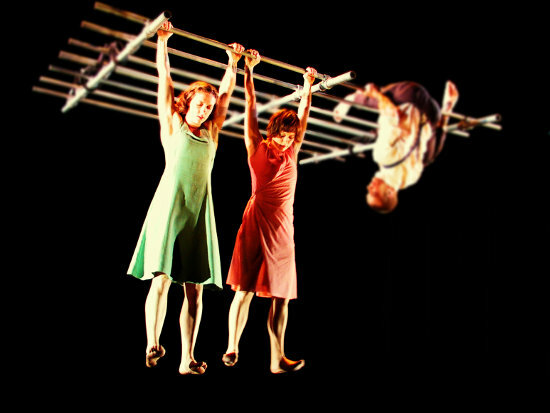 In Arc (3 performers, 30 minutes) three people find themselves stranded together, suspended in the air. Arc examines the instability of their triangle as relationships form and break apart, and explores the idea of isolation experienced in close proximity. Every Action… (4 performers, 20 minutes) is a playful look at the bonds that form when people are thrown together. Four strangers meet before 25 metres of suspended rope. As they explore this elevated set of scales, they discover a world where everything you do will affect someone, somewhere. Memento Mori (2 performers, 13 minutes) is an award-winning, powerful duet performed on a suspended metal frame. It is based on Holbein’s woodcuts of The Dance of Death, where death is represented as a skeleton that dances each of us to our grave. The company have a free-standing truss which measures 9mW x 4mD which all the equipment for the show is rigged from The company have a sound design and Lx plan ready and there are site-specific elements to each show. Total performance space needed 10m x 6m approx. 4 rigging points to hang chain hoists from to pull the truss up, then it is free-standing.